Judging by my website statistics and recent email correspondence from readers of my Lightroom 3 Feature Review it has become apparent that the Lens Correction Profiles that I had made available are a lot more popular than I expected. Unfortunately, time was tight when I first published the Feature Review, which meant that I was only able to build profiles for use with raw images, and even then for only some of the Canon lenses I own. So, given their popularity and currently restricted availability from Adobe’s own lens profile server, I have decided to finish the job and make all of my lens profiles available from this website. However, before downloading them it might be worth spending a few moments reading about how lens profiles are created. 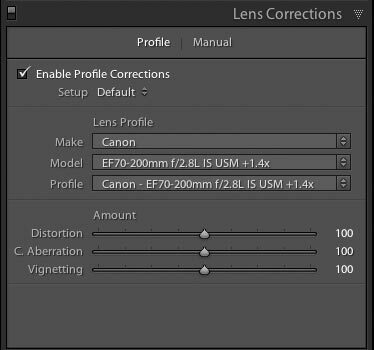 To create the lens profiles for use with Lightroom 3 and Camera Raw 6.1 I use the Adobe Lens Profile Creator application. This application characterises three common types of lens aberrations, namely geometric distortion, lateral chromatic aberration, and vignetting. The actual process of creating the lens correction profiles is broken down into two stages. 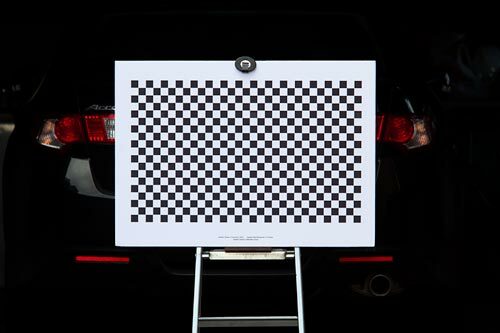 The first involves taking multiple photographs of a calibration target from slightly different lateral positions and angles. The procedure for setting up the target, the camera, etc is fully described in the documents Adobe provide with the Lens Profile Creator application, so I won’t go into it here. Typically, for a telephoto zoom lens I aim to get between 8 and 12 calibration sets. Adobe suggest that each set can comprise a minimum of 3 images, but I find it much better to capture the recommended 9 images per set. When capturing images of the target it’s also important to move the camera slightly left and right of centre as well as tilting it up and down. Again, the documentation provided by Adobe describes the pattern of camera movements. Also, the calibration series for a zoom lens should cover the full range of marked focal lengths at various focus distances and apertures. The key point being, the more calibration sets recorded in the series the better the quality of the final lens profile. With 12 sets, each containing 9 images we end up with 108 images. This might seem like a lot, but for some zoom lenses it’s easy to end up with double that number. Needless to say, it is a time consuming procedure that requires plenty of space, especially for long telephotos, and good even illumination. The illumination level does not need to be constant, but it does need to be fairly even. The image in figure 1 below shows where I’ve set the target up just outside of my garage and used natural light (slight overcast sky) to illuminate the target. With a 400mm lens I can be 20 metres or more from the target, thus capturing the characteristics of the lens when at or near at the infinity setting. It also keeps my neighbours humoured. Ideally, the camera should be set up to capture raw images as these will allow you to create lens profiles for both raw and JPEG/TIFF images. If the captured images of the calibration target are JPEGs the final lens profile for the lens being calibrated cannot be used with raw images. 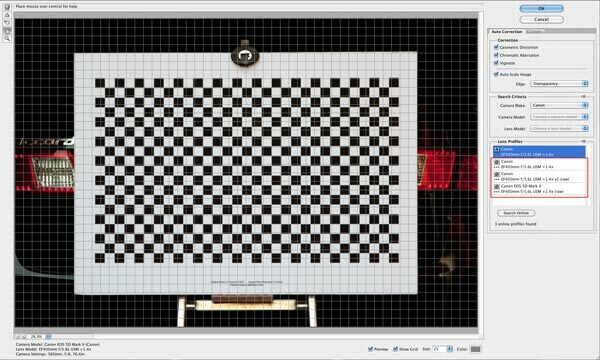 The Lens Profile Creator application can only import DNG, JPEG or TIFF images. Therefore, when all of the images have been captured they must be converted to the desired file format. Converting to DNG is best done via Adobe’s own DNG Converter application, which can be downloaded from their website or using Camera Raw. It’s also possible to use Lightroom, but I think it is much too time consuming to go down that path. When the images making up the calibration sets are all converted it is then time for the second stage of the process. The second stage of creating lens correction profiles begins when you import the DNG or JPEG calibration images into the Lens Profile Creator application. Again, the procedure for using the application is well documented. However, things to keep in mind when using it are: correctly identifying the calibration target used, accurate measurement of the squares, and most importantly – don’t rush. The application is fairly good at error detection, but it’s usually only after it has run through a calibration set when it tells you that something was wrong. So, keep an eye on the image panel on the left side of the application window. After each calibration set has been analysed by the application you’ll be given the option to add the data to a new profile or append it to an existing profile. So, there you have it, creating lens profiles is a fairly straightforward, albeit time consuming. If you’re into making your own lens profiles the Lens Profile Creator application can be download from Adobe Labs. As can be seen in figures 2 and 3 below, putting the profiles to use is fairly straightforward in Lightroom and Photoshop CS5. However, be careful that you don’t select a raw profile (denoted by raw in profile name) when using the Lens Correction filter in Photoshop. If you do so, the results, particularly the vignette model will tend to overcorrect, thus causing over bright corners. As mentioned above, Photoshop CS5 is currently the only method by which lens profiles can be downloaded from the Adobe servers. Profiles downloaded from Adobe will be denoted by a globe icon and those on your hard disk by a Home icon. The profile for the TS-E24mm Tilt Shift was created with the lens set to zero tilt/shift. However, limited testing indicates that it’s still useable up a a degree or two of tilt and/or shift. Obviously, the accuracy of the geometric distortion and vignette correction models is somewhat compromised when the lens is in either tilt or shift positions. So, don’t expect miracles. These lens profiles are provided freely, but should you decide to share them then please remember to mention from whom you obtained them and from where. I’m also happy to answer questions, but I don’t provide a technical support service. Nor do I create profiles to order. Thank you for your understanding and I hope the profiles work well for you.